Lama sudah xupdate blog. Xde feel nk type or share anything. I just dont feel like to do it. Mayb bcause so many things happened at this time of year. Rasa my life pon a bit misserable. Change of workplace/company, SIL wedding xlama lg, planning on buying a house (xnew pon... but Alhamdulillah! We're lucky to get to buy one), spending most of spare precious ti with my 'baby' which i could say lil baby is not a baby anymore. She's already 1 Yo. Plus, xlama lg jengjengjeng akan dpt adik. Im already at 32W of pregnancy. That's the news. Im again, me.... pregnant! 8Months already kn.... uhuhuu Alhamdulillah, im able to BF my lil baby Nabilah for about 7-8months. Until then, susu pon da xde. Ups and Downs...Stressed at the time, why my milk production merudum. 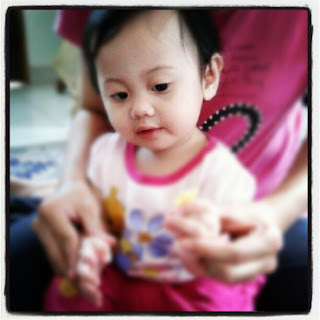 ***Blur*** Stress*** We ***husband and I**** not even prepare Nabilah for any formula milk.Pity my lil baby. Masa tu only Allah Knows how i'm feeling, all this while, bf my lil baby....then immediately hv to change to FM. I've no choice though. I've asked around about my milk production yg merudum, then they just assume that i might be pregnant! I cant even imagine at the time...what if its true.My period pon not in a regular state.... even before pon mmg mcm ni.It's hard to convince others that what u've been through.... Im a bit dissapointed, at the time my milk production xbyk tu, husband keep pushing me to pump more frequent. Ok...I tried...but 2oz a day 8am-5pm (3-4 times of pumping) 2oz?????!!! mmg xlogik. So, I just want to be prepared, caused simpanan susu pon xbyk lg...propose to husband to get a FM for Nabilah. At the time, he refuse a few times... ***Sabar je la masa tu *** After my husband sdiri saksikn and convince that my milk mmg xcukup utk Nabilah, then only...we got her the FM. Masa tu Nabilah mmg mnangis kelaparan. I can feel my B xfull, usually we can feel that our B producing milk when we keep on BF/pump. But... it has not happen anymore. Tired. 32 Weeks. I havent prepared anything ***bag*** and even baju baby pon xbasuh lg. hurm, few things lg xbli. Hopefully sempatla. Coz, skarang ni our hse a bit bz, SIL getting married on this coming sept. So... schedule pon da byk lari.... Xmau komen lebih2. uhuhuhuh I just have to get ready and prepared myself, baby and Nabilah.